Our Military Home Closing Centre locations. We've helped many service personnel in their relocation needs over the years, and now stand ready to help you. Anderson Sinclair NS is registered with the Federal Government's Integrated Relocation Program as administered by the Brookfield Global Relocation Services for Province of Nova Scotia. Our firm with five (5) law offices throughout Province of Nova Scotia is a dedicated and experienced Relocation real estate law firm. Reolcation clients of Anderson Sinclair NS enjoy benefits, advantages, and discounts by simply registering with the firm under myclosing.ca. The Canadian Military in Nova Scotia both through the Halifax, Shearwater, and Greenwood bases have proven their value and worth both nationally and internationally. ASNS wishes to salute our Military both home and abroad and say thank you so much for all you do for us in Canada. 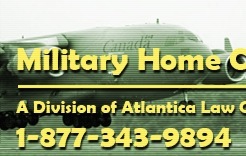 Visit ALG's Canadian Military Gift Program. For further information feel free to email us at bbalcom@andsinc.com.